Personalised sweatshirts can be a great alternative to t-shirts. You can still embroider or print on them, so have a browse of our range and pick up your printed sweatshirts or embroidered sweatshirts today. As with all our other products, there is no minimum order on our custom sweatshirts - as long as you have chosen printed sweat shirts or embroidered sweatshirts. 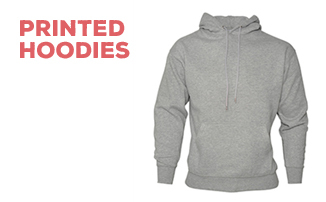 there is a minimum order of £25 for blank sweatshirts. We are industry experts in printing and embroidering garments and clothing, and embroidered sweatshirts are no exception to this rule. You can expect the highest quality custom sweatshirts when you place you order with us. We provide personalised sweatshirts to large companies, societies and individuals - so whether you are ordering 100 embroidered sweatshirts for your company, 10 printed sweatshirts for your society or 1 personalised sweatshirt for a friend, you can count on us.